Brakebills. It's like Hogwarts, but for college students. And less fun. Quentin, who grew up obsessed with the magical land of Fillory (*Narnia*), is suddenly whisked into Brakebills College to develop his unknown skills in magic. Quentin is a magician--not the greatest wizard who ever lived, but he seems to do a fair job once he's had some training. But he's insufferable and I hate him. He is the poster child for poor decisions. Every time I thought I couldn't hate him more, he does another bone-headed thing. Seriously, dude. You are the worst. But the story is ok enough for me to give it 3 stars. Mostly for Alice, but also because I stuck with it through the end. And because I'm a masochist and I already bought it, I will read book 2. 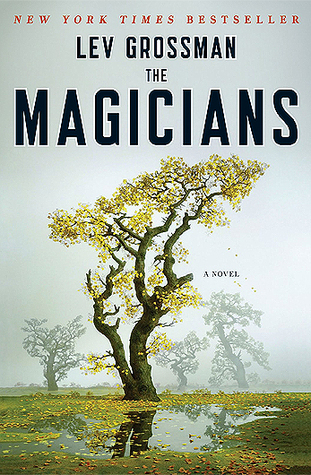 Sign into Goodreads to see if any of your friends have read The Magicians. Eh...Kept on NOT adding this one to my TBR list. But, then I watched the first episode of the new TV series. Looked interesting enough. So, maybe I judged it wrong. Forgot all about it until I saw your review. Nope. I keep hearing people say the first (and maybe second one) are "meh" but that the third one is amazing. I probably wouldn't bother reading them if I hadn't already bought the first one. I think I went in with overly high expectations. This is my best friend's favorite book and she has been begging me to read it. Book 2 will eventually get read, but probably not this year. Unless it specifically fits a challenge.